Quite often, we use the same terms when we talk about social media interaction as we do about communicating in-person: talking “social media faux pas” and “etiquette,” comparing conversion leads to first dates and talking about “wooing” customers. Despite all this, sometimes we forget the “social” part of social media—the fact that behind all those profiles are real people, with behaviors that can often be explained by psychology concepts. For example, take Maslow’s hierarchy of needs, a theory that explains why high-level desires don’t arise unless the lower-level needs such as food and shelter have been fulfilled. 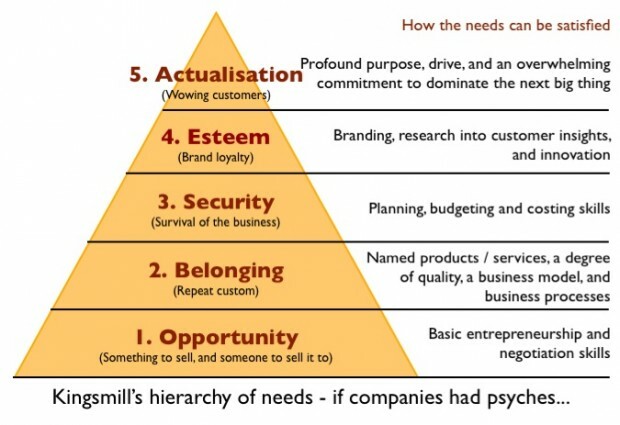 This hierarchy is often represented as a pyramid; and although Maslow never used this form to describe the concepts he coined, it became a symbolic representation of human motivation. 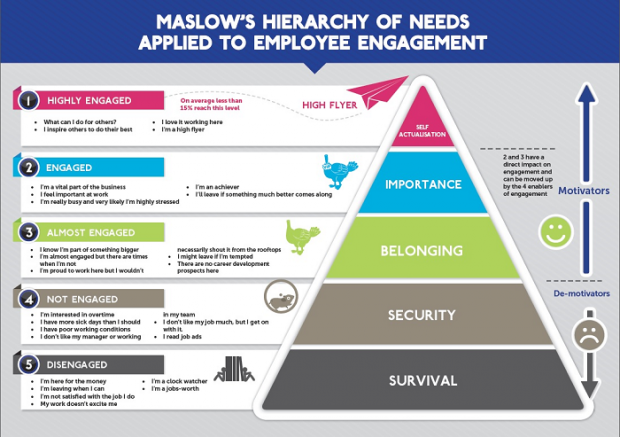 Over the years, Maslow’s pyramid has been adapted to many different environments. …to adding an extra tier for survival (admit it, you agree with this on a certain level). Simply put: in order to build an audience, first and foremost, you need to be present. Before you set out to build a community around your social channels, you need to establish a strong presence by carefully selecting your main topics of interest and your tone of voice. This means creating a set of measurable goals you want each of your channels to achieve—you can do this by drafting a mission statement for each social profile. The “survival” stage is met once other users on the network can see a number of Tweets that reflect your editorial strategy for each channel, so the value in being your follower is evident. Once you have established a tone and a mission for each profile, it’s important to be consistent. While it’s okay for your channels to have a difference in tone to better achieve their business goals (it’s normal for your brand’s Instagram page to be more casual and humorous than your LinkedIn page), all your content should still be on-brand and share one unique story. This makes your brand more recognizable in the social media landscape—think of an online equivalent of the Golden Arches or the congruity of Coca-Cola’s brand colours in Christmas ads. If your followers know to expect high-quality, unique, fun content, they bring more traffic to your website by the way of your social channels. In order to keep the existing audience interested, and attract new followers, it’s important to keep your social media engagement level high at all times. Monitor your social feeds to make sure every Tweet, message or comment directed at you gets answered, especially if it may be negative. By addressing a negative comment, you have a chance of turning a dissatisfied customer into a brand advocate, if they experience an effective solution to their problem. A good way to find and address negative feedback about your brand is to do a sentiment analysis—learn how you can perform one here. When your engagement rate on social media is high, you will notice a devoted group of users who share, retweet and favorite your social media content regularly. If that’s the case, congratulations—you have your own group of brand ambassadors! They may not be followers yet—if that’s the case, try to see if you can change their mind by thanking them for sharing your content, or adding them to a public Twitter list such as “Social trend watchers,” so they know you have noticed them. If they are already following you on one or several social media accounts, consider brushing up on these brand advocacy tactics to keep them engaged. You will know once you reach this stage: the full number of followers doesn’t fit into your profile page and has to be abbreviated with a “k” or an “m” instead, and your Notifications tab can’t even fit the number of interactions that occurred on your profile since your last login. You can look back on your first Tweets, written back in the first level of the pyramid, and celebrate how far you’ve come. But the work isn’t done just yet—in order to stay on top, you should build and maintain your relationship with social media influencers. If the most active of your followers also happen to be influencers in their field, you can mutually build influence by sharing their content to your networks. If you’re not sure how well you’re interacting with those who have influence in your field or a field you’d like to expand into, use influence measurement tools to find the key people in your field. If you’re not sure what determines social media influence, don’t worry—we have you covered right here. So, what do you think? Did we hit the nail on the head, or completely missed the mark? Share your thoughts, or your version of the order for the social media hierarchy of needs for an engaged audience in the comments below!